Revenue growth and profits have been erratic for many transport and logistics companies over the last 10 years, with revenue increasing but profits not matching up to the rate of revenue increases on average. Return on capital employed (ROCE) and profits are relatively low for many companies in this sector compared to other industries, such as technology, consumer non-durables and retail. Despite the challenges faced during the year, the Company has achieved unparalleled financial results for the year ended 31 March 2018. Revenue for the year increased by 11,3% to R72,9 billion. Stringent cost-containment measures and working capital management contained operating costs at R40,4 billion (2017: R37,9 billion), a 6,5% increase, resulting in a R3,1 billion saving against planned costs. As a result, earnings before interest, taxation, depreciation and amortisation (EBITDA) – Transnet’s key measure of profitability – increased by 18% to R32,5 billion (2017: R27,6 billion and 2016: R26,3 billion), with the EBITDA margin increasing by 2,4% to 44,6%. Gearing at 43,4% and cash interest cover at 3,0 times were well within the approved financial parameters. Progress on major projects is also largely on track with 402 locomotives from the 1 064 locomotive programme having been accepted into operations during the year, and 16 more delivered and currently undergoing acceptance testing. 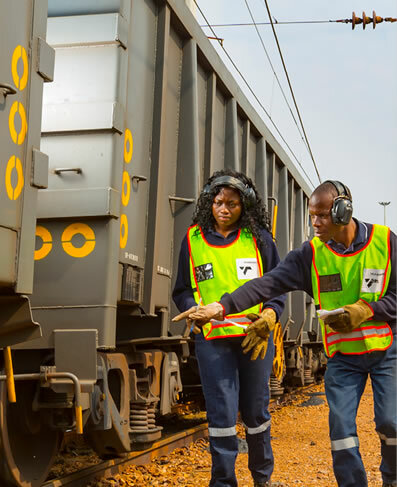 Further, Transnet has commenced its manganese expansion project, which aims to expand the capacity for transporting manganese volumes beyond 5,5 million tonnes (mt). South Africa accounts for 75% of globally identified manganese reserves and 31% of manganese exports by value, making it a sustainable, lucrative supply market to Europe and China. During the year, demand for manganese exceeded budget by a substantial 46,6%. R1,3 billion was invested in the NMPP project during the year. The coastal terminal (tight-line solution), inland terminal, 24” main pipeline and 16” inland pipelines have been fully commissioned and are operational, having transported more than 199,48 billion litres of diesel from Durban to the inland region since commissioning. Following the coastal terminal commissioning in August 2017, the pipeline is now operating as a multi-product pipeline (various grades of diesel and petrol) functioning at full phase 1 flow rates, thereby securing fuel supply for the South African economy over the medium to long term. The inland terminal was commissioned and became fully operational in December 2017. Transnet has initiated various geographic expansionary projects under a new subsidiary, Transnet International Holdings (TIH) SOC Ltd, such as the Nigerian railway concession project worth approximately $2 billion; the approval of a private sector participation investment proposal to operate three berths in the Port of Lamu, as per the LAPSSET Corridor Memorandum of Understanding (MOU) signed between South Africa and Kenya in 2016; and a tender awarded to the Transnet-Diaspora Infrastructure Development Group (DIDG) Consortium to raise finance for the rehabilitation and renewal of key equipment, systems and infrastructure for the National Railways of Zimbabwe. Other important developments relating to our advanced manufacturing sector include the launch of the TransAfrica Locomotive during April 2017 and the prototyping of a fully autonomous (self-drive) Special Inspection Device (SID) in collaboration with the Council for Scientific and Industrial Research (CSIR) to detect obstacles on rail ahead of travelling trains. We are hopeful that the SID’s capabilities will revolutionise rail safety. We are actively leveraging technological advancements to improve operational efficiencies. Technologies such as the Internet of Things, Machine Learning and Artificial Intelligence (AI) will provide valuable insights into improving operational reliability and service delivery to customers; whereas blockchain technology will modernise legacy systems and offer new customer service platforms. The aCTES system – serving as an industry-wide service platform – will help to generate relevant transportation and logistics data from multiple sources across the entire transport eco-system, thereby radically enhancing our customers’ experiences across the logistics value chain. Going forward, Transnet’s growth will rely on our ability to diversify value-added services, and to harness some of the megatrends shaping the global transport and logistics sector. This implies diversifying revenue streams to tap into logistics opportunities presented by rapidly developing economies, such as logistics advisory services, infrastructure development and freight forwarding over large distances. Consolidation of the logistics sector, where larger players acquire small or niche players, is also a growing trend in the transport and logistics sector, in part due to companies’ reduced payloads, low profitability levels and evolving customer preferences. In terms of the latter, our own customer surveys reflect that we are still slow to respond to their fast-changing requirements, which is a combined factor of our systems, customer support structures and our organisational culture, all of which need to undergo a fundamental transformation. Our point of departure draws from our view of long-term sustainability. As a SOC, we cannot defer our developmental mandate. Hence, our sustainable developmental outcomes form part of the essential blueprint for our new strategic direction. This means we need to consider our local suppliers in our expansion aspirations, acknowledge the new ways in which many ‘new economy’ enterprises and youth entrepreneurs work so that they benefit from our enterprise development programmes, involve our communities in our move to ‘digitalisation’, and consider developing the technologies and skills we will need 30 years from now.